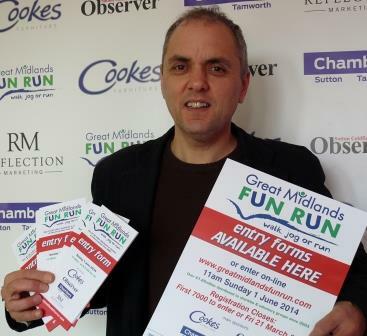 Andy Perks, who works for Great Midlands Fun Run sponsor InkTree Printers as a business development manager, is looking forward to the 12th running of the event and taking on the familiar 8.5 mile route. And its Andy’s familiarity, bordering on obsession, with the Fun Run circuit that sets him apart. For anyone who has yet to tackle the course Andy, who runs it every weekend as part of his training schedule, has some words of wisdom. “Everyone is aware of the notorious ‘Cardiac Hill’ which comes at around 6.5 miles into the course, but I honestly think the one-mile climb from Boldmere Gate up to the Jamboree Stone is possibly a tougher stretch. Andy raised more than £1,000 in 2012 and close to £1,300 last year but this year looks set to hit the £2,000 mark, with his chose charities this year being the Motor Neurone Disease Association and two Birmingham-based good causes – children’s charity, Edward’s Trust and TLC Lottery, an organisation which raises money for three local charities: Acorns Children’s Hospice, Birmingham St Mary’s Hospice and Focus Birmingham. “I originally set myself a target of £1,500 for this year, but thanks to the generosity of my sponsors, that figure was reached last month, so I revised the figure up to £2,000,” Andy said. There is now less than a month to go to the June 1 event and final preparations are taking place. Information packs, which will include the run number and timing chip, will be sent out second class on Monday, May 12. Event director, Tracey Spare has urged people to allow at least a week for the pack to be delivered. Despite taking part in numerous Fun Runs and taking on the course every single week, Andy said it is the big day still is something special. “The Great Midlands Fun Run is a fabulous event for the town of Sutton Coldfield and it’s great to see another capacity field of 7,000,” he said. 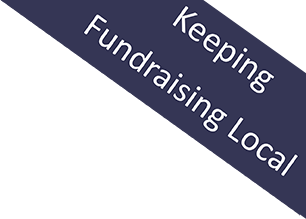 “I appreciate people are regularly asked to sponsor friends and family but I would like to urge everyone participating this year to give that extra bit of effort in their fundraising effort in the final few weeks.